In 1904 (predating the building of the RMS TITANIC by seven years) the Erie & Western Transportation Company, better known as the Anchor Line, commissioned the American Shipbuilding Company of Cleveland, Ohio, to build a 361 foot passenger and package freight steamer for service on the Great Lakes . Her name was JUNIATA, and she was powered by a 3,000 horsepower Quadruple Expansion steam engine, built by the Detroit Shipbuilding Company of Detroit, Michigan (one of only seven such engines built for Great Lakes passenger service). Carrying 350 passengers in staterooms, the JUNIATA was the epitome of first class travel and sailed between Buffalo, New York, and Duluth, Minnesota. Highly varnished mahogany woodwork and wicker furniture was in evidence, and a great oak staircase greeted passengers boarding the steamer, and cuisine worthy of the finest hotels awaited them. Twice remodeled to suit the Great Lakes passenger trade, the JUNIATA operated on the Great Lakes through the 1936 season. In 1937, when new safety features were instituted for passenger ships of American registry, the JUNIATA was retired from service because of her wooden superstructure. In the late 1930s Max McKee and Mark McKee of the Sand Products Corp. of Muskegon conceived the plan of building a new steamer for cross lake service but because of higher than estimated construction costs they had noted Naval Architect George G. Sharpe redesign the plans so they could be incorporated into an existing ship. The ship they purchased was JUNIATA . Late in 1940 the JUNIATA was taken to the yards of the Manitowoc Shipbuilding Company where her wooden superstructure was removed and replaced by an all steel, streamlined, superstructure, the first design of its type in the world. 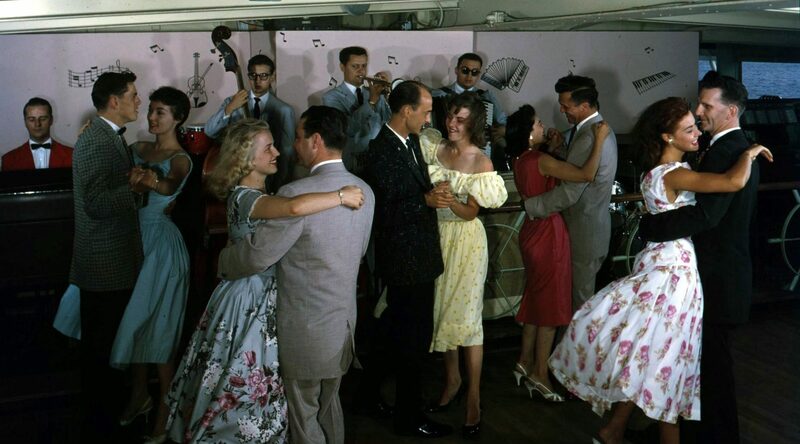 Completely fireproof, the new ship featured air conditioned staterooms, a children’s playroom, a movie theatre, and live entertainment, complete with dance floor. 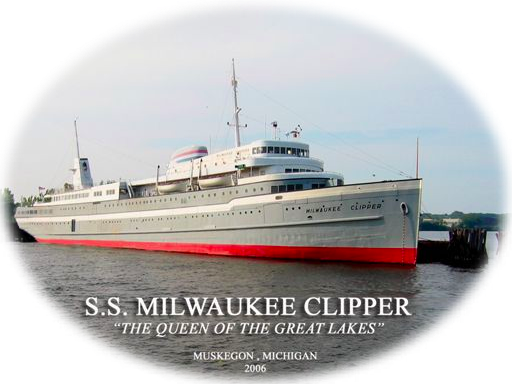 On June 2, 1941 her name was changed to S. S. MILWAUKEE CLIPPER, and on June 3rd she made her maiden voyage to Muskegon . From 1941 until 1970 the MILWAUKEE CLIPPER carried untold thousands of passengers and automobiles between Muskegon and Milwaukee . During the war years of 1942 through 1945 she was operated between Milwaukee and Chicago during week days and Milwaukee and Muskegon on weekends, and also was operated year round between the years of 1946 and 1963. From 1964 until 1970 she operated in the summer seasons only. In 1977 she was sold to a Chicago businessman who proposed to operate her in 3 hour excursion service. Unable to gain certification for service, she was renamed S/S CLIPPER, moved to a new home at Navy Pier in Chicago and was operated as a floating maritime museum and convention facility. In December, 1983 she was listed on the National Register of Historic Sites, and in May, 1989 she was designated a National Historic Landmark. Moved in 1990 to Hammond, Indiana she was once again named MILWAUKEE CLIPPER and was planned as the centerpiece of what was billed as “one of the largest marinas in the nation”. In 1996 the MILWAUKEE CLIPPER was moved from the Hammond Marina to make room for a new casino boat, and was offered for sale. In 1997 the Great Lakes CLIPPER Preservation Association was formed, dedicated to preserving the now legendary steamer. Able to gain ownership, on December 2, 1997 , the group returned the MILWAUKEE CLIPPER to Muskegon, after an absence of 20 years.